An earthquake and a hurricane in the span of a few days– what a weird weather week for New York City! If it weren’t for Irene cancelling work this weekend and keeping me housebound, I would not have gotten to make this Cornmeal and Fruit Loaf. Something about baking at home helps calm my nerves if I’m feeling anxious, and wondering if our house would make it through the big storm without any major damage was making me fret (more than just a bit). Thankfully, a little water in the basement was the extent of it for us. If you are on the East Coast, I hope you managed to stay safe. Whether you are baking to take your mind off something, or just because you want a tasty breakfast treat, this loaf works. It’s totally made by hand…theraputic, quiet and easy. 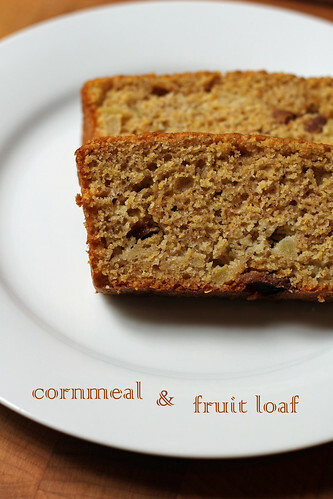 And it’s hearty and satisfying to eat…cornmeal and apples (fresh and dried) give it great texture. It’s not too sweet, so it definitely leans more towards a comforting breakfast or snack than dessert. For the recipe, see Baking: From My Home to Yours by Dorie Greenspan or read the always enjoyable Engineer Baker, as it was Caitlin’s pick this week. Don’t forget to check out the TWD Blogroll! I liked this too. Here’s hoping Mother Nature relaxes a bit now. I also made this with apples and I liked it a lot. Glad you are ok after the storm! We’ve had fairly peaceful weather in Seattle. This was tasty! Glad you survived the mayhem. dried apples add a nice texture. i like making my own too! I put strawberries in mine! i’m glad to hear that you made it through the weather madness ok! baking definitely sets me at ease. i think it’s because i have to focus my energy on measuring, mixing and taking care not to overbake. and in the end, i get a tasty treat for my trouble 🙂 instant stress relief! your loaf looks just lovely! I wonder if the fruit adds a lot of moisture to the bread. My bacon version was drier than the fruit version seems. I’ll have to try adding fruit sometime, but the apple and pear suggestions in the book just weren’t exciting me. You have a house with a basement and a CSA? It’s like my New York City dream! Glad you survived the craziness last week–I was away in California and can’t believe I missed an earthquake and a hurricane while I was gone. PS Love your last couple of photos–looks like your new camera is working great! I agree. Totally therapeutic the way Dorie has us mix this up. Yours looks great.